Provide comfort for the family of John Goepp with a meaningful gesture of sympathy. 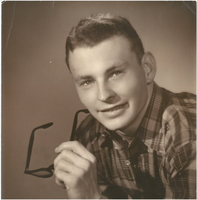 Mr. John Karl Goepp, Jr.
Mr. John Karl Goepp, Jr., age 75, of Griffin, GA passed away on Thursday, January 31, 2019 at Brightmoor Hospice. Mr. Goepp was born on October 26, 1943, in Griffin. He was a veteran of the U S Navy and retired as a painter. Survivors include his wife Robbie Jean Goepp; daughter, Denice Michelle Goepp; granddaughter, Rebecca Ann Truitt; great granddaughter, Kendra Michelle Truitt; and sister, Susan Amelia Burns. A memorial service for Mr. John Karl Goepp, Jr. will be held on Sunday, February 3, 2019 at 4:00 p.m. at Mt. Carmel Methodist Church in Alvatton. Reverend Winston Skinner will officiate. Interment will follow in Mt. Carmel Methodist Church Cemetery. In lieu of flowers the family request donations be made to the Mt. Carmel Methodist Church Building Fund, 7477 Mt. Carmel Road, Gay, GA, 30218 in memory of Mr. John Karl Goepp, Jr.
To send flowers in memory of John Karl Goepp Jr., please visit our Heartfelt Sympathies Store. Reverend Winston Skinner will officiate.